Beautiful 3 Bedroom 3 Bath Luxury house located a short distance from the white beaches of Manuel Antonio and the new Marina Pez Vela. The home is located in an equestrian community with over 300 acres and 10 custom built residences. The property is pristine with many fruit trees, tropical plants, Horses, boarding stables and trails for riding. 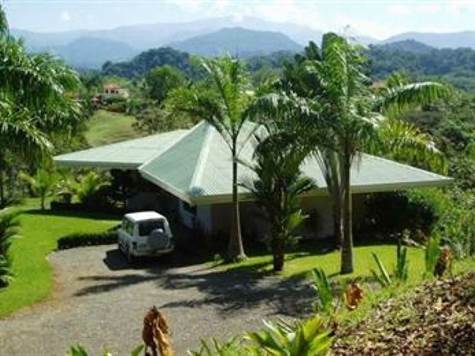 There isn’t a nicer private and gated community anywhere just outside of Manuel Antonio. The house is designed open air style that allows all the breezes and the mountain views to come into effect. It boasts almost 3000 sq ft with 2 levels. There is a private road leading to the house as well as private and secure parking. The views from this house overlook the lush gardens of Finca Tranquilas and the mountains of the Cera Narra range. This is a perfect house and location for anyone wanting close proximity to the beaches and nightlife but just far enough away for total peacefulness and privacy.